TheTravelJohn Disposable Urinal is a disposable urinal used by men, women, and children. 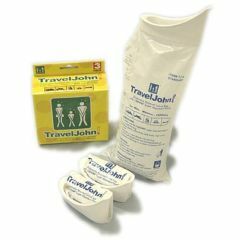 Each TravelJohn contains an inner pouch of Liqsorb, a biodegradable polymer substance that immobilizes bacterial growth quickly by absorbing the liquid waste and turning it into an odorless, spill-proof gel that is nontoxic and waste disposal safe. The unisex collar makes it easy for anyone to use whether sitting or standing, with a spill guard to prevent backflow during use. Puncture resistant pouch is 2 x 2 x 5" folded and holds up to 20 fl oz (600cc). Contains 6 packs of 3 pouches each. Do not flush. Only con is the cost. Following Surgery. Emergency. Also very useful camping. I first purchased this product for my daughter for a camping/concert (Bonnaroo) trip then for her to have following hip surgery. It was perfect for both uses. After the surgery it was painful to get around and also to squat so I just kept them by the bed along with a small trash can. She did not want a potty chair plus that would have still meant squatting. They fit snugly so know leakage and the material inside turns to a thick jell when saturated so they don't spill either, plus no squatting. We traveled by plane for her surgery and I was worried about her being able to use the small airline bathroom. She is tiny so I knew she could get in the door, just with crutches and such a small space plus needing to squat and not being able to go in and help her, I figured she could stand and go in the restroom. They worked perfect, plus she didn't need me to help her every time she needed to go. Camping: The porta potty smelled horrible after baking in the sun all day, plus at 3AM there was no need to go out alone to go to the bathroom. We are both going to keep one in our purse in case of a dirty bathroom when out and also one in the glove box. She thought they where great! I've told my sisters and friends about them, I think all women should have one in their purse to avoid sitting on dirty toilet seats when out. They would be perfect also if you have smaller children, I think we all know how that is, I wish I had had them when my children where small. They do have a seperate line for children and the price is much better on the childrens product. Useful when you just can't leave. Easy Storage. Convenient to use. Lightweight. I am a law enforcement volunteer who sometimes is at a location where I can't be relieved for a break. Because public urination isn't always a good idea, the Travel John Portable Urinal is a great alternative. My testing of the product showed that it didn't hold (or absorb) quite as much liquid as stated, but still has plenty of capacity. The Travel John Portable Urinal is now a part of my equipment bag. Lightweight. Compact. Best Invention for women. I travel quite a bit and can't stand using filthy restrooms. I will use the travel john if the public toilet is unsanitary. I've also used these on a scuba trip when a sanitary restroom is unavailable. I think these are the best invention ever made for women! I love not having to squat over a filthy toilet, instead I can stand up comfortably and not worry about a mess or germs. Thanks! I really like the Travel John Disposable Urinal. My friends and I have used this product. It is perfect in a pinch. This product is great for quick relief, especially when your out and on the go. The women loved it and the guys came up with a lot of ways to apply it. Camping, back yarding and especially sports events. won't leave home without them!! Young children. Emergency. Following Surgery. Elderly. best product available. small enough to carry. sturdy enough to trust.easy disposal. Is there a shelf life on these? The contents are equivalent to kitty litter and last a very long time, if not for ever. Can I use this more than once or is it one time per bag? I have a hyperactive bladder esp. when flying and am also in a wheelchair so the restrooms are generally inaccessible. I am wondering if I should take the number of times I need to go or can I make multiple "deposits" until it's full and then dump it? Yes you can reuse it. I have put about 1 quarter in the bag before it would spill over. It works great for me. You can use it until full. i take along a gallon zip lock bag and then it is is easy to conceal in my purse until I can dspose of it. There's a demarcation line on the bag. You can use it up to that point. If you go above that line, the granules will not absorb it. I'd like to know if there is an issue with high temps. I live in the desert and in the summer time the highs can be in excess of 115 degrees. If I keep these in my car is there an issue with the excessive heat? If they would be in my car for an extended period of time will the gel break down or stop working at some point? The warmer it gets the faster it absorbs. So it should not be a problem. I stored several packages in a srawer in a warm part of my house for an extended period (over a year -- maybe two or more). The gel became hard like a rock and did not work. So, I don't recommend storing them in a hot car for long periods of time.